The embargo has officially been lifted! For some time now, various representatives of the gaming press have been playing Star Wars: The Old Republic. Today they are allowed to give their general impressions of early-level gameplay. Keep an eye on this space to see the whos, the whats, and the wheres. Separate articles on Combat, Companions, Dark/Light, Flashpoints, Impressions, PvP, Story, Trooper, Worlds. Jedi Consular (jaded ex-SWG player actually enjoys SWTOR), Jedi Knight (expectations exceeded), Smuggler (story fan feels vidicated), Editorial (NDAs, Canon, Red Zones), Full Beta Preview (Trooper + assault cannon = total devastation, Dark/Light, Huttball). 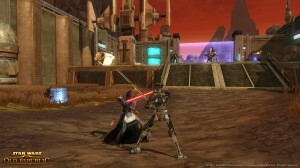 RPGFan: SWTOR reviewed through the lens of its predecessors (KOTOR, WoW). Ten Ton Hammer: Jedi Knight overview, with nice descriptions of abilities.